Written with both thoughtfulness and Çlan, this is a Jewish intellectual’s remembrance of coming of age during the Depression, WWII, and the immediate post-war period. Editor and critic Solotaroff (A Few Good Voices in My Head: Occasional Pieces on Writing, Editing, and Reading My Contemporaries, 1987, etc.) focuses largely on his relationship with his parents: his father, a hypercritical, domineering man who often is “oblivious to other people’s feelings, ‘’ and his mother, an emotionally supportive but mostly passive woman whose behavior usually is characterized by “scatteredness and dependency.” He also writes about his slow transformation from an unruly, sometimes delinquent adolescent to a young man with serious intellectual inclinations. With its many fine passages on competition and friendships with other boys, and on men, sports, curiosity about sexual dalliances with women, and military service, Solotaroff’s book expresses a vigorous masculine sensibility. As for his Jewishness, it’s considerably less important than his Americanness and is found more in family dynamics than in religious observance or even ethnic solidarity. 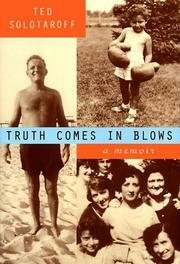 Thus, Solotaroff observes that, for him at the time, WWII and the Holocaust were “as existentially remote as a movie.” His well-crafted book, which is just the right length, contains such piquant passages as this about service in the postwar navy, which was “an abrupt immersion in the working class, in its crudity and cruelty, its noise, crowdedness, and stinks, its narrowness and dullness. Also, in its modes of adeptness, shrewdness, perseverance, its gregariousness and laughter, its loyalty and courage.— Having traveled with Solotaroff through the first two decades or so of his sometimes difficult and often very colorful life, readers will eagerly await a sequel.